The unit, designed with capability to launch combat forces within six hours anywhere in the CENTCOM theater, sent two rifle companies to support Special Operations Command units operating in Northern Syria between January and April, Marine Col. Christopher Gideons, commander of the task force, said at the Potomac Institute. "They were integrated with special operations forces, absolutely integrated. We were providing Marine infantry, we were providing indirect fires, and we were providing anti-tank fires," he said. 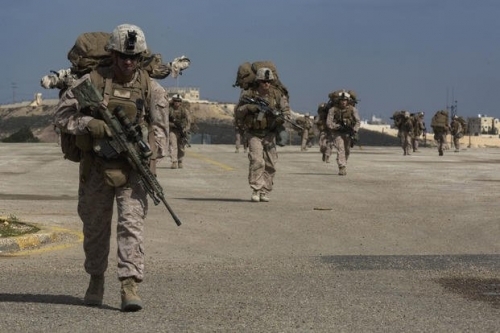 Over time, more support was needed in Syria, so Gideons deployed more Marines to grow the platoon-size element to "two infantry companies minus" that were located in two separate locations in Northern Syria. "We would displace out of our small forward operating bases we were operating out of, move closer in behind the SDF and then provide fires -- a lot of times mortar fire ... and of course as you were getting into an engagement, there is the potential for stuff to come back at you," he said.